Writing a book is something that almost everyone wants to do; a recent survey found that an astounding 81 percent of Americans think that they have a book in them! If you’re one of those people who want to write a book, or you want to write another book, you might want to come stay with us to actually get the work done. Below, check out a few reasons why Studio 6 in Plano is the perfect place to concentrate on your writing. Browse our site to see pictures of our rooms and to learn about the amenities we offer. When you’re ready to reserve a room, give us a call! If you’re serious about writing, you probably realized pretty quickly that it isn’t possible to get a lot of work done when you’re surrounded by the distractions of your home. It seems like there is always something else pulling your attention in another direction. At Studio 6, we have everything you need to stay focused: quiet rooms, comfortable furniture, and privacy. When you’re here, you can turn off your phone and disconnect from the internet and focus on your writing. When you need a break from scribbling, want to check your email, or you’d like to catch up on the news, log on to our WiFi and turn on the big screen TV. When you’re here, you decide how connected or disconnected you want to be! Studies have shown that spending time alone in nature can help you be more creative. If you’ve gotten stuck at a tricky part in your book, it might be a good idea to get outdoors and reset your mind. In the area surrounding Plano, there are tons of great places to get outside and soak up some sun and some solitude. These outdoor areas run the gamut from beautiful parks in the city and impressive trail systems that snake throughout large swaths of land, to the full grandeur and unspoiled beauty of Northeastern Texas. When you take a few hours to think about something besides your book, you should be able to return to the page with a fresh mind that can solve the problems in your manuscript in exciting new ways. Best of all, unlike when you go camping, when you’ve had your fill of nature, just come back to your room at Studio 6 and get typing! Plano is a wonderful place because it is so close to so much that you can use to find inspiration. 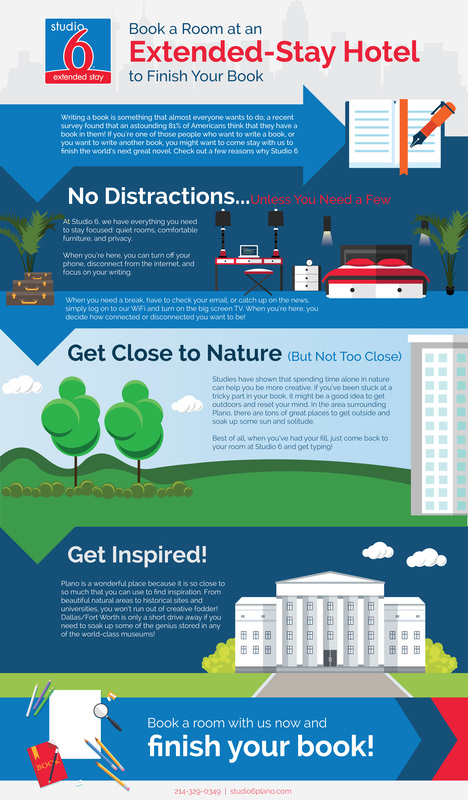 From beautiful natural areas to historical sites and universities, you won’t run out of creative fodder! Dallas/Fort Worth is only a short drive away if you need to soak up some of the genius stored in any of the world-class museums! Book a room with us now and finish your book! We’re Plano’s favorite extended-stay hotel because we have all of the amenities you would come to expect — WiFi, cable, full kitchenettes in each suite, and the most comfortable rooms! We look forward to having you stay with us! Call us if you have any questions! ©2017 Studio 6 Plano, Texas | All rights reserved.